There are 450 million newspapers sold each day across the world. 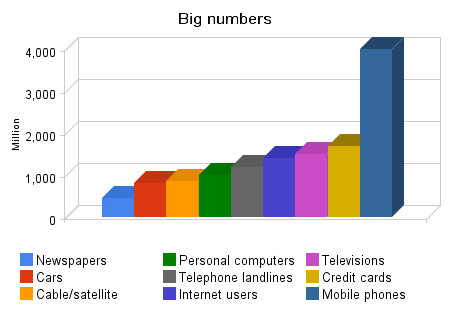 There are 850 million subscriptions to cable and satellite television. There are 1.4 billion internet users. And there are 4 billion mobile phones. I have written before about the growing importance of mobile phones, in terms of both their number and of what they can do. In one sense it’s all self-evident: the omnipresence of mobiles is an unavoidable feature of daily life. But in many other ways, we have scarcely begun to think through the implications of what a while ago I called “the transition connected devices are making from being big tethered things to being small wandering things”. The typical top-end smartphone of today, becomes a mid-range phone in only three years. Think of your cool new iPhone or N95 or E90 Communicator, in a few years its a hand-me-down phone used as a toy by young kids… The processing power of a top end smartphone of today, such as a Nokia N96, equals the total computing power of all 50,000 computers on the planet that existed just 40 years ago. 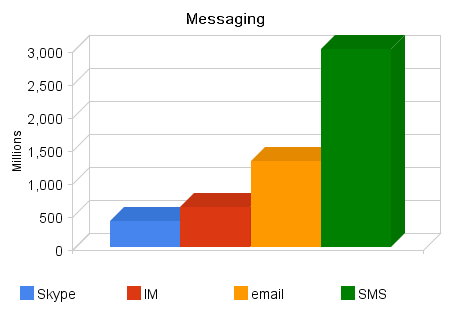 SMS text messaging is by far the most widely used data application on the planet. You can reach 2.5 times more people via SMS text messaging than on any fixed landline telephone! Twice as many people send text messages as own a TV set. Almost twice as many people tap on the phone keypad to send text messages, as sign purchases onto credit cards. how do you design services which take account of the new possibilities and the preferences of a new generation of customers? how do you manage a continuum which runs from people who only ever even turn on a mobile phone if there is an emergency to those Ahonen describes texting every few minutes of every waking hour of every day? Or, putting those two questions together in a different way, how do we sustain the current delivery model for those who still need it while building the capability of doing things very differently?